Home / entertainment / Polaroid Zip vs HP Sprocket: Which one should you Buy? It is quite wonderful to be able to see our photos printed instantly on small square photo papers, there is so much we could do with them. We can make personalized photo frames or stick those pictures on the wall to decorate your room or just paste them in your scrapbook and much more. But what's the limitation here? The only thing you will not be able to do is to edit your pictures, add emojis to them, adjust brightness, add effects and lot more which you can do with your smartphone through various apps available on the internet. Here comes in the importance of Mobile Photo Printers. 1. You do not need to buy a separate Polaroid Camera. 2. You can edit your pictures before printing them. 3. They are small and portable, easy to carry anywhere. Since now you know why you need Instant Mobile Printers let us begin with the comparison of two top-selling smartphone printers in the market. 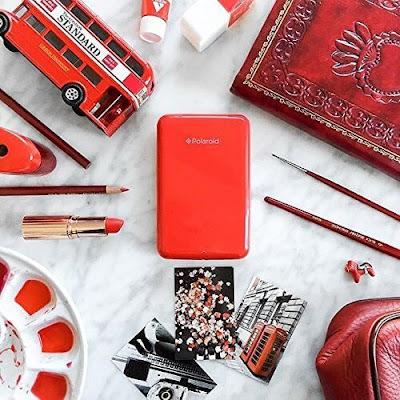 Polaroid Zip was launched back in 2015, first in the line of mobile instant printers, it did win many hearts. Surely, Polaroid never lets us down. It prints 2x3 smudge proof, full colored pictures on peel back sticky sheets. It has a cool and compact design, easy to carry anywhere. HP Sprocket was launched in 2016 which could print faster and better. Although its basics are same as Polaroid Zip but it produces better images and you can also add emojis to your pictures. Read More: Canon Selphy CP910 vs CP1200: Which one should you buy? The above table shows a clear comparison between Polaroid Zip and HP Sprocket and on the basis of our study we would prefer HP Sprocket over Polaroid Zip. Why HP Sprocket is better than Polaroid Zip? Polaroid is the beginner and yet now the only player standing in the market of Instant Cameras. No doubt it has produced best Polaroid Cameras ever but its goodwill could not keep the same faith in the market of portable mobile printers. Both the printers work on ZINK technology which means Zero Ink. You may be familiar with it. This technology enables you to get prints without worrying about ink being used up quickly, which means saving a lot of money which otherwise gets spent on changing or refilling cartridges. Amazon is selling Polaroid Zip at a very low price than the manufacturer has proposed and if you decide upon buying it from a retailer then it will cost almost equal to HP Sprocket. Zip was launched in 2015 and it can also be a factor of its low cost. HP Sprocket has a beautiful design and is available in three vivid colors- Red, Black and White, although my favorite is the White with a touch of Gold in it. It looks stunning, it has the latest technology and is priced accordingly. There is not much difference in the dimensions of both the instant mobile printers, but as per customer reviews, polaroid zip can fit only in a large pocket or a purse, while Sprocket is designed in such way that it can easily fit in your pocket and is quite comfortable to carry. 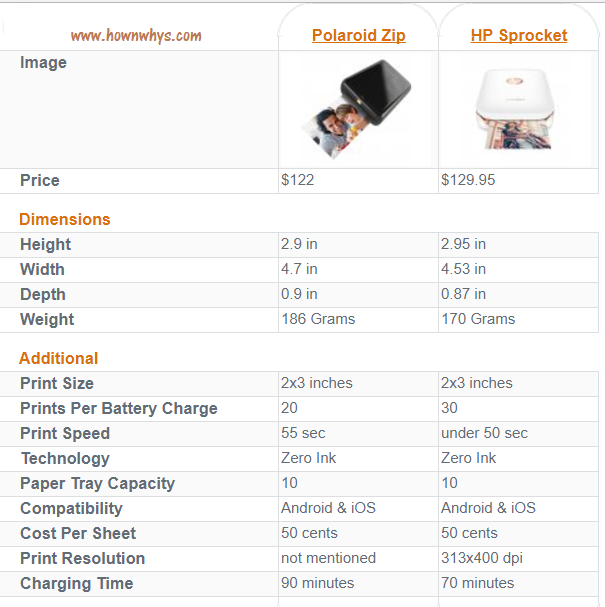 HP Sprocket is lighter than polaroid zip, another reason why it is our first choice. Both the devices have only one power button and everything else is controlled through the App. Therefore you need not worry about it's starting printing inside your pocket. 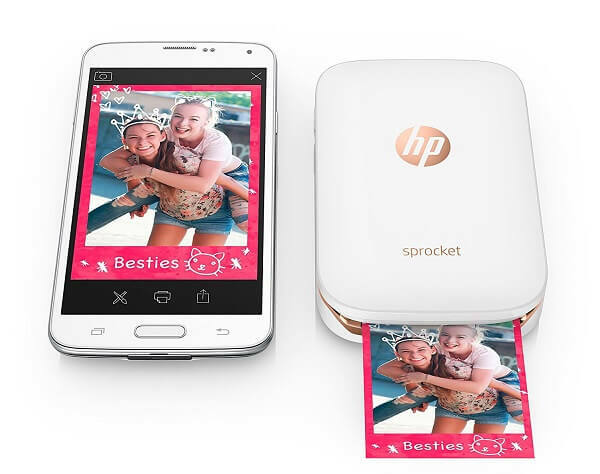 HP Sprocket has a pre-determined resolution of 331x400 dpi, which results in clear and bright images. Customers say that the images produced by it are quite detailed. It also prints the edits made from the app well. Whereas Polaroid Zip has not disclosed any resolution and customers have complained many times that the picture quality is below average with limited contrast. It is definitely not the right kind of printer if you are into capturing nature scenery and other specific things. 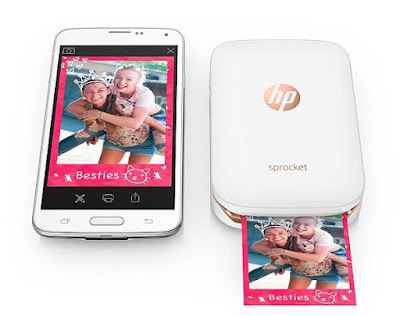 HP prints faster than Polaroid, where zip takes 55 seconds, sprocket prints within 50 seconds. One of the major reason behind zip's low speed is the Polaroid App. The App is quite slow and bulgy, it takes a lot of time to operate and send print commands.Also, editing makes it even more difficult to print clear pictures. On the other hand, HP compatible app is fully functional and has lots of editing features like stickers and different fonts. It does not get slow and prints clear edited images. The App pulls your pictures from other apps like Instagram, Flicker, and Facebook and makes them available for further edits right-away. Zip takes much more time to charge completely while HP charges faster. It consumes more battery and prints less, may be due to its old technology, while sprocket prints more images at one time of full charge. Zip prints 20 images in one charge and sprocket 30, though you have to load again after every 10 prints as the print tray capacity is low on both the devices. HP Sprocket is clearly better than Polaroid if you want good quality images with cool editing and faster printing and latest technology. There is not much difference in the cost of both the Portable Mobile Printers, therefore, the price is not a relevant factor to consider while making your purchase. Polaroid Zip can become better only if they work on the picture quality and printing speed. We hope we will soon get a new and improved Instant Mobile Printer from Polaroid. Our choice is HP Sprocket what is yours? Tell us in the comments and share your experience with both of them. I have spent the entire day going between about 6 mobile photo printers, and none of the stupid review would just say flat-out THIS is what you should buy and why. THANK YOU for doing that for me. I am a 64 yr old non-tech gal and I just wanted to hear THIS has better pictures....Done, buying it now. HP should send you a commission check.